Get Inspired: Are these England's next Ashes heroes? As Alastair Cook and Andy Flower were debating who should fill the number three slot in the batting order for the second Test in Adelaide, they would be reassured that the future of English cricket looks strong. While the senior Test team prepare to resume battle with Australia in the Ashes, the England Under-19s are also on tour. They are in the United Arab Emirates for a tri-series against their hosts and Pakistan, in preparation for the U19s World Cup in February. And if this talented bunch needed any more incentive to raise their games, they need look no further than those who have gone before them. The two players vying for that number three spot in Adelaide, Ian Bell and Joe Root, are two of the current squad who first caught the attention of the international selectors with assured performances for the U19s. In fact, only three of the senior squad in Australia have not represented England at that level. Kevin Pietersen and Gary Ballance were brought up in South Africa and Zimbabwe respectively, while Jonny Bairstow's rise was so meteoric he was playing first XI county cricket for Yorkshire when he was considered for selection. 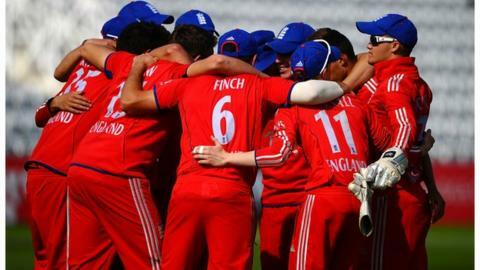 The next Ashes series will be in England in the summer of 2015. Will anyone from the current U19 squad follow Vaughan, Flintoff, Bell and Broad into the senior team? Get Inspired profiles some of the names to look out for in the next few years. Why will he be a future star? Sibley smashed his way into the cricketing spotlight and record books last season when, at 18 years and 21 days, he became the youngest player to score a double century in the County Championship. It was not the first double ton for the local player either - when he was 15 he became only the fourth player in Surrey Championship Premier League history to make 200, doing so for local team Ashtead. As well as having abnormally high levels of concentration, he has been gifted with a natural talent to spot bad balls and dispatch them to the boundary. Why this player is a future star? To be classed as a medium-fast bowler at 17 years of age must mean you are doing something right. That is where Yorkshire's Josh Shaw finds himself after making his way through the ranks at Headingley. Shaw's capabilities extend to the bat, with his position at number eight drawing comparisons to fellow Tyke Tim Bresnan. Whilst a first-team appearance has yet to materialise, Shaw has already been part of England's vision in both the Development Programme and Under-19s over the past year, with bigger and better things expected from the youngster in years to come. Why is this player a future star? As well as having already tasted England Under-19 success, Barber has played for Hampshire's Second XI for much of last season and was a regular wicket taker. He has a good action and generates good pace. Being a left-armer, he provides an awkward angle for right-handed batsmen to play, and is noted for his ability to swing the ball in to them. At just 19, he has plenty of improvement left in him ahead of a potential first-team breakthrough for Hampshire in the 2014 season. Providing cover behind the stumps are Hampshire duo Thomas Alsop and Lewis McManus. The pair join a host of talented wicketkeepers at the club, playing alongside Michael Bates and Adam Wheater. McManus was voted their Under-17s fielder of the year in 2012, and the youngster is competent with the bat too. At the top of the order alongside Dominic Sibley are 18-year-old Ryan Higgins from Middlesex and Yorkshire's Jonny Tattersall. Higgins has been singled out by the Middlesex coaching staff, which includes Mark Ramprakash, as the best of a exceptional group of youngsters. Expect to see him challenging for a place in the first XI next season. Hoping to follow in the foot-holes of Stuart Broad and Jimmy Anderson are bowlers Matthew Fisher and Jack Winslade, whose late swing and lower order runs make him something of an all-rounder. Also gaining recognition for skill with bat and ball are Will Rhodes and Harry Finch. Finch blazed two half centuries and an unbeaten hundred for the England U19s in August. A month later, he was rewarded with his first-class debut for Sussex. Bowling right-arm medium-fast, Finch has understandably been compared to his county team-mate Luke Wright. The spin ranks are covered by off-spinner Miles Hammond and slow left armer Karl Carver. Carver has been likened to Monty Panesar and is renowned for his economical spells. If you want to get involved with cricket, visit our Get Inspired: Cricket page.